Spiritual Guidance: “There are moments when even those of us with great courage feel tested beyond our faith. Doubt, darkness and despair can creep into our minds and lash our hearts with fear. Perhaps there seems to be good reason for our pain – the loss of a loved one, a cherished hope dashed, disturbing human behaviour, the state of the environment or some other unexpected and painful shock. There may be no particular reason for it, and yet we are somehow gripped by feelings of anxiety or despair that we cannot resolve, no matter how hard we try. 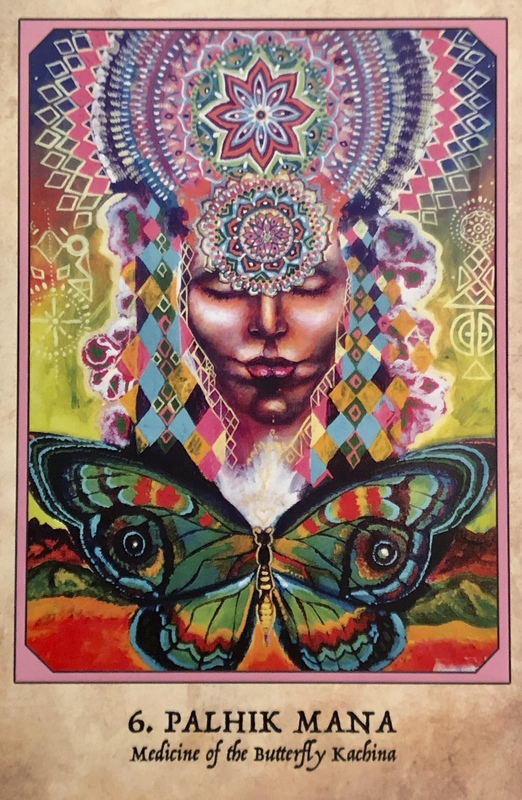 The healing soul medicine of the Butterfly Kachina comes to you now to alleviate your suffering, to remind you that everything yo have gone through has been part of what has made you strong, compassionate and wise. When all seems lost – perhaps especially then – our soul needs the gift of seeing the light, love and wisdom of Great Spirit at work behind all things, at all times, always reaching out to us and always offering love. The soul needs faith and hope like the body needs air to breathe. Faith keeps the soul alive and well. You do not have to regret anything that has happened. You do not have to judge yourself or any other, or wish that things had been different. You have not missed out. You have not messed up. You have been learning and growing. What is required from you now is a willingness to let it fall away, because the person you once were actually no longer exists. YOu may not fully realize it yet. Like the butterfly trying to crawl on the ground like a caterpillar, you may mourn the loss of your old caterpillar ways. Yet, if you take a moment to witness yourself anew now, you will realize that you are not the person from two years or ten years ago. You can then open to the gifts that the Butterfly Kachina is bringing to you now – well-being, new life, vibrancy, freedom and happiness. Healing Process: “Butterfly takes us out of seriousness and into childlike joy. Is there something that you used to love as a child? Is there some activity that makes you feel healthily childlike – perhaps laughing a funny animal videos or going for a walk out in nature? Coloring or pulling a hula hoop out of the back of the wardrobe? Playing drums on the pots and pans? Singing and dancing in your living room? Take some time to be with your inner child self and be engaged completely in the present moment. You may have had a dream shattered recently. Something you though you really wanted, only to have it stripped away again. Or maybe you got exactly what you wanted, and couldn’t remember why you had asked for it. Either way, there is a huge lesson here. There is no point in overanalyzing, regretting, or focusing on the past. What happened was absolutely what needed to happen. A redirection of sorts. It is time to allow yourself to move on. In order to pass to the next chapter of your life, and make the very most of it, take some time to acknowledge all that you have learned. Then bless and release it all as you allow yourself to step beyond it. It is time to reframe your life, your reality, your abilities and your place in the world. It is time to see yourself as the powerful manifestor that you are. It is time to embrace your transformation and focus inward on what else is possible for you at this time. Find your joy, find your passion, find yourself. All these roads lead to your Soul Purpose; the true reason you incarnated here, at this time in exactly the body and the circumstances you are in. There is no coincidence, there is a reason behind it all. Your Soul chose this. Things are about to change, possibly quite dramatically. Embrace this change and allow yourself to soar above the drama, seeking the answers you desire. Receive the medicine of butterfly with grace, ease, gratitude. Open heart and open mind.